People buy watches for different reasons. Some people simply want the time. There’s nothing wrong with that; that’s why wristwatches were invented. Other people want to collect works of art and examples of fine craftsmanship. That’s OK, too, and there’s no shortage of really expensive timepieces that you can purchase that do that. Others want a functional fashion accessory – they want something that will tell the time and they also want it to look good with whatever it is they happen to be wearing. That’s pretty common, and there are lots of “fashion” watches on the market. Some are better than others, and the prices are all over the map. One example in this category that offers attractive, functional watches at a decent price would be Armani Exchange. Armani Exchange watches look good, work reasonably well and won’t break the bank when you buy them. Read on for the full Armani Exchange watches review. The build quality of Armani Exchange watches is good, though not exceptional. It’s certainly good enough for most people, as they’re looking for a fashion watch and not something that’s going to help them survive the outdoors or dive to 200 feet. The cases are rugged stainless steel, though some have a gold tone to them. The watch face is protected by hard mineral crystal. Most models have water resistance to 50 meters, which means that it’s OK to get them wet. You won’t want to go diving with them, but if you forget to take it off before swimming or getting in the shower, you’ll be OK. Straps are either leather or stainless steel. On the whole, these watches are solidly built timepieces. The movements are sourced from China, and the watches are likely made there, as well. Most models in the product line have battery operated quartz movements, though a few at the higher end of the price range have automatic movements and even feature a “skeleton” look so that you can see the moving parts inside. A few models are also hybrid, or “connected” watches that are more or less smart watches. They look like regular timepieces but have a few “smart” features, such as automatic time setting and email notification. They’re not really full-blown smartwatches, but they’re about halfway there, at half the price that you’d pay for a proper smartwatch. With fashion watches, you’re generally not going to find technical innovation, and that’s certainly true of this brand. They’re attractive timepieces, to be sure, but you’re not going to find elaborate complications or any other features that you wouldn’t find in other brands in this price range. Styling is modern and attractive. Colors lean towards the basics – black, white, silver, and gold. A few models have chronograph features and a couple even offer digital displays, though most are analog. Women’s models are elegant looking and would look great with either casual wear or business attire. If you’re looking for bling, you won’t find diamonds or even crystals in the line, but they’re nice looking timepieces that will look good with a variety of clothing styles. Everything in the product line will look great for nearly any occasion. Care and maintenance is pretty straightforward, as most of the product line is powered by a quartz movement. Quartz watches are highly reliable and should keep accurate time for a couple of years before you’ll need to have the battery replaced. Mechanical models will need to be worn regularly to keep them running smoothly, and you will probably want to have them at least inspected by a jeweler every five years or so. You’ll want to store your watch away from extremes of temperature or humidity and strong magnetic fields, as any of these things can harm the timepiece. With proper care and occasional battery replacement, you should get years of service from your timepiece. 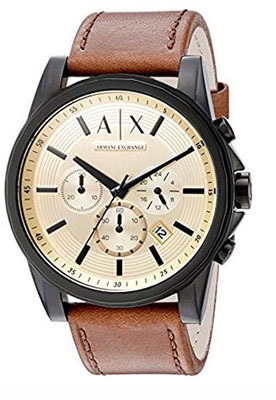 Armani Exchange watches are owned by the Fossil Group, and they have a reputation for making solid, quality watches. With the purchase of your watch, you’ll receive a manufacturer’s warranty against defects in craftsmanship and materials for two years from the date of purchase. This is an industry standard warranty; we’d estimate that 90% of all watch brands offer a warranty of that duration. That said, defects are likely rare, and if they do pop up, you’ll likely see them soon after purchase. 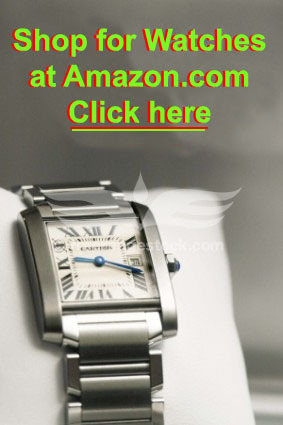 Pricing of Armani Exchange watches is quite reasonable, as designer watches go. There are about 40 watches in the women’s line and about 50 in the men’s line and prices across the board range from a lo of about $100 to a high of about $395 or so. The hybrid “connected” smart-ish watches are priced at about $175. These are quite reasonable prices for good looking, functional timepieces, and they’re inexpensive enough that you might want to buy two in different styles. 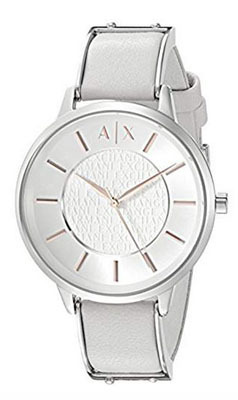 You can find Armani Exchange watches for sale at a number of sites online, as well as a number of department stores and perhaps even a few jewelers. The line is widely available and unlike other brands, the sales are not restricted to specific, factory-authorized dealers. As the product line is rather large, don’t be surprised if any given retailer doesn’t have everything in stock. Most should have a good representative sample, however. As “fashion” watches go, this brand is better than average. Some brands market watches as an afterthought and go with cheap timepieces that barely get a mention on the corporate Website. Others shoot for the high end, arranging for expensive Swiss makers to market their own watches under that fashion brand’s name. 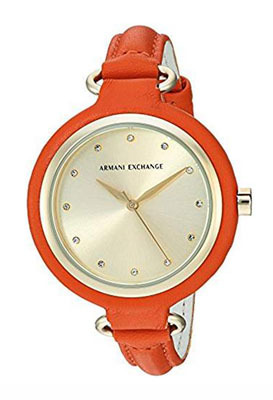 Armani Exchange watches fall in the middle. They’re solid, well-built watches that look great, but don’t offer gold or diamonds, so they’re going to fall towards the reasonable end of the spectrum, price-wise. That said, they’re nice looking timepieces that will work well with anyone’s wardrobe and which will fit nearly anyone’s budget.